It's like the old days on the biblioblogs, with intelligent, engaging and useful discussions across a number of different blogs on a topic of interest and relevance, with lots of exciting suggestions for the future. I'm talking, of course, about the current discussion on the future of textbooks, and what we, as digital pioneers in our area, have to contribute. OK, I know that that sounds a bit pompous, but I think it is true. There are more interesting ideas bobbing around the blogosphere than you'll find anywhere else. In order, the blog discussion on this topic goes something like this: AKMA, NT Blog, Sansblogue, Anumma, AKMA, NT Blog, NT Blog, Exploring our Matrix, AKMA, with apologies if I have missed any contributions. James McGrath has a useful breakdown of different models in his post. In this post, I would like to draw attention to a key difficulty with current print textbooks in our area. There is an extent to which publishers are conscious of the fact that the textbooks they are marketing have a rather old-fashioned feel, especially in relation to the lack of internet resources. They know that most modern students are more media-savvy than their professors and that it is a case of digital natives vs. digital immigrants. In a bid to plug this gap, a good number of big-selling textbooks now have a special companion website (Mark Allan Powell, Introducing the New Testament, Bart Ehrman, A Historical Introduction to the New Testament, Luke Timothy Johnson, The Writings of the New Testament). This is hugely commendable -- the flashcards, the powerpoint presentations, the summaries -- these are all helpful additions to the student's experience. But all of these fine websites have a central difficulty: they are extensions of the single-authored textbook that they are complementing. On the whole, they simply supplement the textbook with similar material, often authored or constructed by the publishers, or people working with the author and the publisher. They have some idea of the potential for doing something different on the web, but they do not exploit the potential for linking to, embedding, integrating, engaging with existing resources on the net. These textbooks therefore remain, essentially, single-author products, albeit products that are supplemented by useful, additional, publisher-supplied materials. The potential that one sees in these types of companion websites, combined with the shortcomings of these websites, is in fact our invitation to rethink the idea of the "textbook", as I and others have been urging. The weakness with the textbooks mentioned is that they are thoroughly single-authored affairs. In some respects, that is, of course, an excellent thing. I could not have a higher opinion of my colleague Bart Ehrman, for example, who is one of the authors mentioned above. But in other respects, it is a problem. The traditional textbook's difficulty is that however strong its author, it is still that author's views that are presented, in all their particularity. What the textbook of the digital age can produce is something that is genuinely multi-authored as well as multi-media, a resource that encourages the university student to think critically from the earliest point by listening to different voices speaking on the same subjects. This is where the digital pioneers come in. Because we have at least some understanding of how the internet works, and what its potential is, we are in a position to do the kind of thing that these traditional textbooks, with their limited companion websites, are aspiring to do. James McGrath has an excellent, thorough, critical Review of The Hebrew Gospel and the Development of the Synoptic Tradition. I am reviewing the book myself for CBQ, and I have overflowed a couple of pieces here to the blog (James Edwards), and it is interesting to see James McGrath seeing all sorts of things that I had missed. I must admit that I have never been a big fan of the "textbook", especially at university level. University students are at the stage where they should be reading a range of primary and secondary materials and over-dependence on an introductory-level single-authored book will not bring out the best in them. I appreciate, at the same time, that students often want something that will help them out with introducing a new topic and it can perform a useful function in guiding them through the early stages of something complex, and so it is a crutch that I have sometimes recommended, though always with lots of warnings and with a good range of different introductory textbooks too to illustrate the point. Recent discussions about the possibilities of an online Old Testament Textbook (AKMA, NT Blog, Sansblogue, Anumma, AKMA, NT Blog) might cause us to reflect on the whole scenario of textbook-writing a bit further. As several have implied already, the digital age allows us to rethink the way we do textbooks and I'd like to support Tim, Brooke and AKMA in that kind of thinking, and then to encourage still more radical thinking about what we are trying to do when we conceptualize textbooks. I think textbooks have a couple of shortcomings, both of which can be overcome in the digital age. One relates to the "text" bit and the the other relates to the "book" bit. In this post, I'd like to address briefly the text bit. Old-fashioned textbooks are just too texty. For those of us who have some investment in the digital world, and that is all of us who are engaging in this discussion, we are familiar with the fact that it is now possible to access audio and video material far more straightforwardly than it was in the past. In our area, there is a wealth of good audio and video material and this is only going to increase with time. Think, just for starters, about Bibledex from the University of Nottingham, or the several resources available at St John's Nottingham. I have added audio and video pages to lots of the NT Gateway pages in order to gather together the best of these resources. The importance of this should not be underestimated. Different students learn better with different media, Some respond much more positively and learn much more quickly by listening to audio, others by seeing things represented graphically. And that is to say nothing of the importance of thinking through how we work with students with disabilities, in particular, in this context, those who are blind or near-sighted. Newer, digital textbook resources can integrate, embed, link to material that is not just blocks of text. Hey, in a perfect world, you could persuade the authors to record their chapters so you could distribute digital audio (and video — or perhaps, a video abstract of each chapter). So at this point, you have a textbook that’s free to consult as web pages, free to download as PDFs, and (again, ideally) free to listen to/watch in digital media. I like the sound of this because it addresses the importance of integrating multi-media into the newly conceived, digital textbook. It is the kind of thing that makes me enthusiastic about the way that AKMA is talking. But my point is that the authors of the textbook in question do not have to wait for the perfect world for this to happen because high quality audio and video resources are already available on the web for free. Let's say you are talking about the topic of form-criticism and introducing Richard Bauckham's recent contributions about the involvement of alleged eye-witnesses. You could record your own audio or video about this, in which you attempt to summarize his position, or you could watch and listen to the man himself doing it for you. Examples of this kind could be multiplied. My point is not that we should stop producing new resources -- of course not. But rather that we should start thinking seriously about the integration of good existing resources into our new model. AKMA, Funding Neopublishing, continues to post things of interest on the topic started by Anumma, Open Access Intro to OT. In my previous post on this topic, The Future for Textbooks Online (with thanks to Tim Bulkeley on Sansblogue for an excellent discussion of my post alongside AKMA's), I suggested that we don't have to begin working on projects like this from scratch. There are now so many fantastic resources available on the web that the big issue is not so much how we create great resources but rather how we organize and publicize the existing ones in ways that will be helpful to our students. I suggested as one model the evolving NT Gateway, though I express interest in looking at other related and overlapping models. is authored by a socially diverse body of contributors. The first two elements are at the heart of a site like the NT Gateway -- it links to freely available materials and is itself free; it is historical-critical in focus; and the resources to which it links are as diverse as the authors that write them (which in fact means that too many of them are from too narrow a group, but that is a reflection, of course, of the state of the guild and something we could do something about in this kind of project). No re-inventing the wheel is necessary. Where excellent and diverse resources already exist, freely available on the net, one may as well work to those strengths rather than attempting, at every point, to create new resources. There is a huge psychological boost in working with existing resources rather than beginning from scratch. A new project can be hugely daunting. Working collaboratively to develop existing resources, to organize, to add, to fill in areas that are lacking -- this can be encouraging and fulfilling. It is much, much cheaper than beginning from scratch. It is much less labour intensive than beginning from scratch. It is easier to harness the great advantage of the internet in being fully multi-media. You can pull in a range of resources, prose paper, website, podcasts, video clips and so on without the need to develop new websites, to begin recording new audio and new video. As children of our age, we are unduly impressed by what is new. But sometimes, in scholarship, the old is good. The advantage of a dynamic approach to this issue is that it enables us to draw from the storehouse both old and new. I suspect that our difficulty in this area is that we are still inclined to think too narrowly in terms of the old-fashioned "textbook". I would like to brainstorm a bit more about this, but I think it might need a separate post. I must have missed the move to a new address. Since there may be others who missed it too, and who do not have it on their blogrolls, I add a mention here. The explanation is derived from Bart Ehrman's New Testament: A Historical Introduction. That is not one of the best starting points for understanding the Synoptic Problem, but there is something delightful about the fact that it has inspired this kind of demonstration. What else would we like to see Mr Potatohead(s) explaining? Pistis Christou? "Why do you want to go to Nazareth? What's in Nazareth?" A ten-year old friend of the family in Tel Aviv asked me this before we had left for Galilee. It was, of course, a delightful, unconscious echo of Nathanael's comment in John 1.46. I must admit that my expectations for Nazareth were not high. Lots of people had told me not to expect too much, and I knew that the huge, bustling modern town would not be the kind of place that would reward the Biblical Scholar interested in seeing something of interest and relevance to the first century. One of the most memorable things about the trip was the whole business of coping with the traffic and trying to work out where to enter Nazareth and where to park. After driving around it a few times, we eventually just headed straight into the middle and tried to park. We made the big mistake of trying to go into a tiny, packed underground parking lot at which a rather aggressive character tried to persuade us to give up our car keys so that he could park the car for us, all for 25 shekels. Having backed out, we found a much more acceptable parking place in the open air for just 6 shekels, and I got to hang on to the car keys. We did two things while in Nazareth. The first was to visit the Basilica of the Annunciation. It is a beautiful looking church, and inside there is a kind of grotto that is alleged to have been part of Mary's house. And underneath the basilica, there is some interesting archaeology. As usual, shirts were required to go over the girls' shoulders. As elsewhere too, there were no crowds. Just the odd visitor. 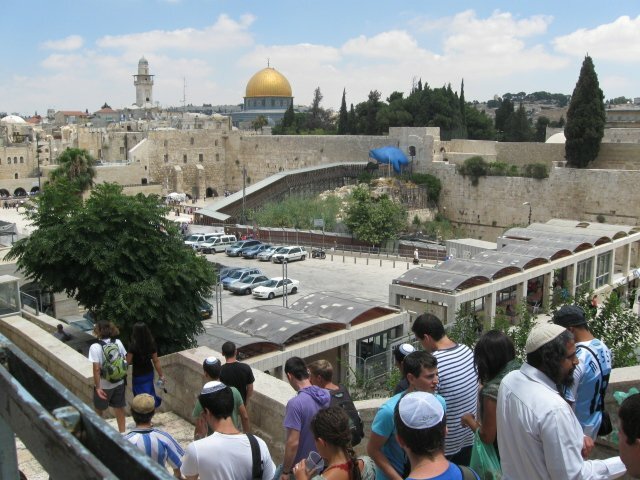 It seems that the end of June is not a busy time for tourism in Israel. 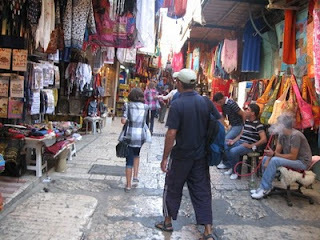 The second thing was to walk through the large, partly covered market. This was a strange mix between the strange and the familiar. There was a lot of the same kind of market tat that you see in markets all over the world, but this was combined with a very middle-eastern feel. As far as I remember, there was very little here for the tourists -- not here all the olive-wood carved nativity scenes and the Holy Land jewellery that you find everywhere else. The place was not bustling with people, and a lot of the market-stall people were just sitting and chatting and watching the odd passer-by go by. Our day in Nazareth ended in disappointment. I had been keen to visit Nazareth Village, a kind of re-creation of first century Nazareth, with some archaeology, in a site that has had proper input from consultants like my colleague Eric Meyers. It has a nice website, which I consulted before we left, but there is no information on there at all, at least none that I could find, about how to get there. In the light of this, I assumed that it would be rather like old Capernaum or the Jesus Boat, easy to find and well-signposted. But it was not. It's impossible to find, or at least it was for us. After circling Nazareth city several times, driving through it several times, exploring the Isaeli Nazareth town and everywhere else in the general region, and having asked several people, we were none the wiser and never found it. So a suggestion to those running Nazareth Village that it would be worth adding a "How to find us" section on your website, and to invest in some signs and publicity in the general area. Perhaps we were being thick, but I bet there are thousands of others who miss it too. One other minor disappointment: I was hoping to see a cheese shop in Nazareth. The sign "Cheeses of Nazareth" really ought to be irresistible for an entrepreneur out there. AKMA has an excellent post on FOSOTT (Free and Open Source Old Testament Textbook). It's full of the kind of "blue sky thinking" that we surely need to engage in if we are interested in harnessing the values of the internet and the possibilities it provides for collaborative, educational models for our students. I have been talking about something similar in relation to the New Testament Gateway for a little, looking to expand and develop it as a resource into something that will work as a kind of uber-textbook for New Testament studies. My thoughts have been derived in part from my antipathy towards that kind of textbook culture that straitjackets students into becoming over-reliant on just one voice. There are pedagogical and economical advantages, I think, in the kind of approach that I have been describing, of attempting to provide introductory materials for new students and flagging these up in the clearest way possible. These advantages relate to our reliance on a text book culture. Many students become over-dependent on the one text book that their lecturer or professor has recommended. Instead of seeing the Introduction to the New Testament as one person's survey, they take the author's views as gospel (even when the author is encouraging a critical approach to the gospels!). What the text book says, the student should believe. This is frustrating enough at secondary school level, but it really should not obtain in universities and colleges. But what is the alternative? To recommend ten text books? And so we arrive at the problem of access to good secondary texts. The average student spends a fortune on text books (book costs, source: Jim Linville) and still the bright university student will need more. If you have a large class, even the multiple copies in the library will quickly vanish. Since moving to Duke, I have been moving more and more towards reliance on free internet resources in teaching. There are now so many of them, so many very good ones, that the job is becoming easier all the time. It occurred to me that what I do in my teaching I could do also on the NT Gateway, and to show people where to find strong academic materials for free online. No more complaints about the books missing from the library! No more complaints about the cost of the text books! This kind of approach brings with it a huge advantage, that students can get used to hearing a range of voices on the range of topics in their curriculum. They can read across a range of resources both old and new. They won't be constrained to hearing just the text book's view on canon, or the Synoptic Problem, or the authorship of the deutero-Paulines. And the more interested they become in a topic in question, the more than can dig down deeper and find yet more resources. I am not, of course, advocating the end of print resources in teaching but I am suggesting that sites like the NT Gateway can provide a means by which we can think differently about the text book culture. A range of voices, a range of topics, with guidance for the student about how to access them. There are, after all, things that you can do on the internet that you can never do in a text book, like listening to podcasts, watching videos and playing games. In the long run, when resources like this are attractive, free and easily accessible, what will be the impetus to stay focused on the single-authored-text book? (Full post here; full series here). Of course those comments were in the context of a discussion specifically about the future of the NT Gateway, and I think the NT Gateway could continue to evolve to make itself ever more useful as a kind of uber-text book for students, but it does not need to be the only portal providing that kind of service, and collaboration could work not purely within sites like this but also between different sites, different projects, different "books" until we are at the point where talking about a textbook sounds very old hat. Before going to Capernaum, I felt that I knew a bit about it, not least because of the superb filming and CGI reconstruction that took place for the BBC's Son of God (2001; shown in the USA as Jesus: The Complete Story). 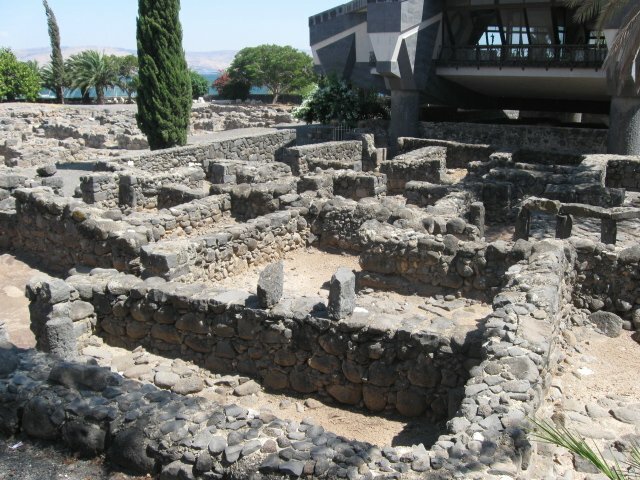 In that programme, the modern church that now stands atop the excavations of first century Capernaum, was flown away like a flying saucer, and the ancient walls arose and and the first century town came to life. Seeing those excavated remains in reality, though, was special. And if it weren't for the overwhelming heat, we might have stayed even longer than we did. Capernaum is unlike any other of the ancient sites you might visit in Israel. The modern town of Kefar Nahum is separate from the ancient site, so when you approach it, it is just for the excavations and the church -- no businesses, no cars; just a little gift shop and port-a-cabin where you pay your 5 shekels each (just over a dollar) for entry. As with any of the "holy sites", the women get asked to cover their shoulders at this point, so we got used to carrying an extra shirt around in our back-pack. The site features an impressive fourth / fifth century synagogue as well as remains of a first century one. As we entered the site of the excavated synagogues, we passed by a group of American tourists sitting on benches listening to a tour-guide reading out the story of Mark 1.21-28 and making something of a meal of it. Then, nearby are the excavations of first century housing including "Peter's house", over which the modern church structure hovers. We entered into the church so that we could look through the glass floor at the excavations below, but the church was full of earnest, frowning private worshippers who did not appreciate our presence. It is an odd experience to spend time in Capernaum. For those interested in the Historical Jesus, it is a site of greater interest than Bethlehem or Nazareth, but it is the latter two that have generated the tourism, the trade and the pilgrimage. One of the areas where academic Biblical Studies struggles to make any kind of impact on popular impressions derived from the New Testament is over the motif of the hypocrisy of the Pharisees. As I have mentioned previously, in How do you make a Pharisee?, the motif is immortalized in the Pharisäer, a cheeky cup of coffee, with the rum hidden in the coffee beneath the whipped cream, a drink that is pretending to be one thing and manifesting itself as another. Is it any wonder thoughtful young adults turn their backs on such an illiberal institution? Nowhere in the Gospels does Jesus even raise the subject of homosexuality. Yet in his name today's Lambeth Palace pharisees are marginalising many of the most spiritual members of their flock. The battle for the reputation of the Pharisees is something that is worth fighting, though, and David Bivin has a fresh contribution in an article in The Jerusalem Perspective Online, The "Hypocrisy" of the Pharisees. 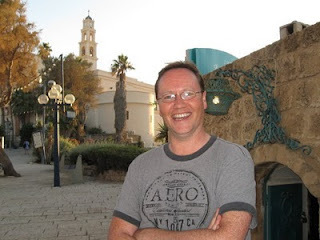 A Biblical Scholar's First Impressions of Israel VIII: The "Jesus Boat"
I was keen to get to see the so-called "Jesus Boat" in (the) Galilee. I have often shown pictures of it to the students in my Historical Jesus class, one of whom subsequently emailed me to let me know that she had visited it herself on the recent Duke in Israel programme. Having read a bit about the boat, I don't think I learnt anything new when I saw it in real life, but it was still excellent to get the chance to see it for real. The "Jesus Boat" is an ancient Galilean boat, discovered in the Sea of Galilee back in 1986 and, remarkably, salvaged, protected, and put on display at the Yigal Allon Museum, near the shore where it was found. The location is pretty close to Tiberias, where we were staying. A ten minute drive at the most. It's advertised on the signs as an "Ancient Galilean Boat" although its own publicity likes to use the term "Jesus Boat", in respectable inverted commas, in order, quite reasonably, to attract the tourists. The museum itself appears to be set in a larger kibbutz style community, but the boat is clearly the major reason that people visit the place. There were almost no tourists at all while we were there, so when we walked into the room with the boat in it, we had it all to ourselves. I felt quite privileged, actually. It's well worth a visit, and if you have a car, it's a short stop on your way up to Migdal or Capernaum from Tiberias. The video above is not ours but is from the excellent Bibledex project, taken during their recent trip to Israel. 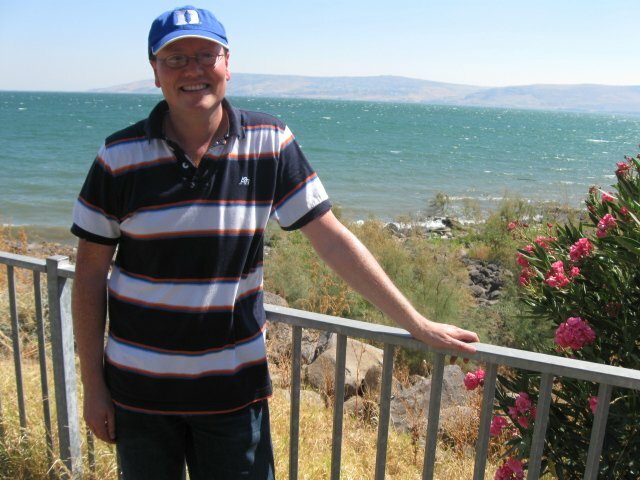 For the student interested in early Judaism, the historical Jesus or Christian origins, it is of course essential to spend some time in Galilee. Or "the Galilee" as everyone in Israel calls it, as well as the most trendy New Testament scholars. Since I want to be trendy too, I am trying to get used to the definite article, but years of familiarity with "Galilee" make the transition difficult. Our Israel trip was split into two. Tel Aviv was our base for the first half, and we spent the second half in Galilee. We hired a car and drove up from the Dead Sea. As far as we could work out, the best way to do things was to stay in Tiberias, which is the big bustling city by the Sea of Galilee, with thirty or more hotels and tons of shops and restaurants. We stayed in the Prima Galil, which Tripadvisor told us was the third best hotel in Tiberias, gathering its good reputation from friendly service and great breakfasts, though the rooms are a little pokey and price a little high. Tiberias itself is an unattractive kind of city, but we found a great little restaurant called "Galileo" (Galileo, get it?) on the outskirts, where you can sit outside and watch the sun set over the Sea of Galilee, while eating good soup and hot bread with hummus, tahini and the like, and drinking the Goldstar beer. I keep saying "the Sea of Galilee" through familiarity. It is, after all, what Matthew and Mark call it. Luke talks about Lake Gennesaret and John about the Sea of Tiberias, but the modern name is Lake Kinneret. We drove around the whole thing anti-clockwise on one occasion and it takes about 30-40 minutes, if memory serves. There are some lovely views at certain points. In the picture here, I am standing in front of the lake in a spot where Jesus may have stood, though I don't think that railing was there back in the first century. I have Capernaum just in front of me. Towards the end of our stay in Tiberias, we took one of the boat trips out onto the sea. This "lido" trip was 24 shekels each (c. $6) and set off from a jetty that proudly advertised that it belonged to American TV evangelist Benny Hinn! Frankly, the sea trip was a touch disappointing. The lido just drove out for a bit and then turned around and came back, less than an hour in all, and without a clear idea of what it seemed to be trying to do. More happily, though, there is a great restaurant nearby called "Decks" where you get to sit outside, overlooking the sea, while eating barbecued food and drinking Goldstar. They even bring a mini-barbecue to the table so that the sweet potatoes continue to cook on the charcoal while you eat your bread, hummus and tahini. 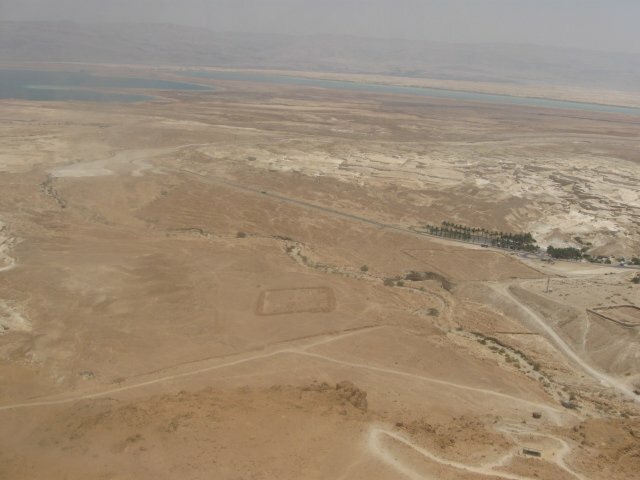 If you are staying in the Dead Sea, or even if you are not, you have to make a journey to Masada. It's one of the richest educational experiences you can have, and if you are interested in early Judaism, it will be fascinating. For the first-time visitor, one of the most striking things is just how strongly Herod's presence can be felt, something that might be said for several other places in Israel, Jerusalem, of course, and Caesarea in particular. You can imagine Herod (who in my mind is always played by Peter Ustinov) feasting there, with his imported fish and his fine wines. You can see where he bathed, Roman style, and you can see the large storehouses. Remarkably, several of the frescos survive from Masada, and you can see good quality reproductions in situ as you walk around, and then look at the real things in the museum afterwards. Of course the story you are going to witness is the one of the rebels and the Roman siege, and being at Masada does enable you to re-imagine elements of something that previously you've just read about, or seen in the 1981 film starring Peter O'Toole. You can see the part of the walls where the Roman siege made entry, and there are sling shots piled up not far away from the same site. On the day we went, it was absolutely roasting up there, and the heat was enough to keep us on our toes in getting round the key sites before we passed out. I am afraid that we did not go up and down the pathway. I am not great with heights and it was very, very hot, so instead we enjoyed the cable-car ride with its fantastic views. At the bottom, after pouring lots of cold liquids down our throats, we took in the museum at a leisurely pace and found it fascinating, not least seeing an original flip flop, a lock of hair and a comb from Masada. Seeing the ostraca on which the names were scribbled, and which may have been used for the drawing of lots before the mass suicide, provides a remarkable way of imagining the events of 74 CE. If you are going to Israel, on no account miss out on the Dead Sea experience. We took just a night there, but we would have loved a week. It is quite remarkable. That stuff that everyone tells you about floating on the Dead Sea is absolutely true. I would have illustrated it with a photograph of me doing it, but I'd rather spare you the sight of me in my trunks. Instead, the picture here is the view from our hotel window. We managed without a car while we were in Tel Aviv but hired one for the second half of the trip, and this visit to the Dead Sea marked the mid-point. We drove from Tel Aviv to the south west part of the Dead Sea, and found the drive a lot of fun -- lots of proper deserty landscapes, and the chance to do some camel-spotting. As you approach the Dead Sea, there are signs indicating that you are getting lower and lower, and then however-many metres below see level. There are several big resort style hotels in the Ein Bokek area. Ours was huge, with a couple of pools, and buffet-style breakfasts and dinners on an industrial scale. The hotel had its own beach area and doing the floating thing is a lot of fun. The water is really warm, bath-water temperature, and the salt is everywhere, like sand where it is shallow, and then like rocks when it's a little deeper, so much so that I cut myself on it when I went out. 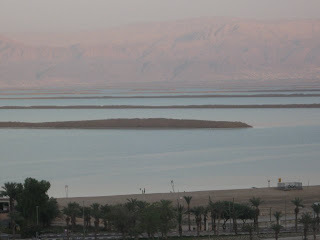 The advantage of staying at the Dead Sea is also the location, close to Masada, which is where we went next. 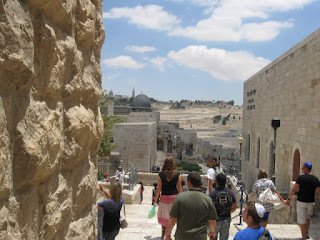 I loved visiting Jerusalem. Even though a day is nowhere near enough, you can do a remarkable amount in a day. The highlight, without question, was walking through the tunnels that run along the bottom of the Western Wall of the Temple, now below ground. We had an excellent tour guide who was knowledgeable and witty. As he showed us the Herodian stones, he offered the memorable line, "If they spent this much time on the box, imagine how wonderful its contents". We walked around lots of other fascinating locations. Naturally, the ones most of interest to me were the glimpses of the Herodian / Roman era sites, including part of a road that looked like it could have been excavated in Rome itself. We looked at "David's tomb" and the "Upper Room" above it, the latter fascinating for its little changes reflecting pre- and post-crusader activity. We did lots of walking, and took in also the Church of the Holy Sepulchre. We had some good nosh too -- little pizzas on the Via Dolorosa, while drinking a kind of lemon and mint concoction that we also had several days later in Galilee. 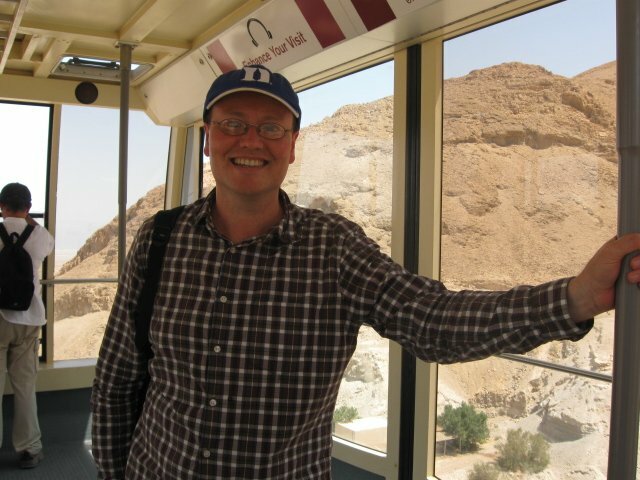 Alas, it was the day that England crashed out of the World Cup in that 4-1 defeat to Germany, but I will choose to remember it instead as a momentous first trip to Jerusalem. Well, of course you have to go to Bethlehem. It wasn't top of my list of priorities, and I did not expect to find it particularly striking, and my expectations were met. 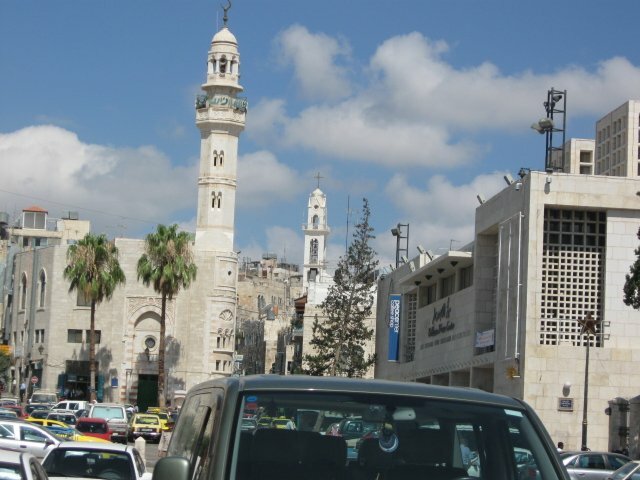 The most interesting thing about Bethlehem is the utter contrast with everywhere around it. You have to spend a good ten or fifteen minutes crossing the border into Palestinian territory, where border officials are slouching in their seats with big scary rifles on their laps. On the other side of the border, you can tell straight away that you are no longer in Israeli territory. You are greeted by a whole line of taxi-drivers, shop-keepers and others looking for your business. We did not do a lot in Bethlehem. We looked around the Church of the Nativity, perhaps most memorable for the tiny entrance door to the main building and the little room down some stairs that supposedly marks the spot of Jesus' birth. Since we were there on a Sunday, there were lots of people there to worship, and we got a few dirty looks and shoves. Remarkably, I also met a film-crew there that I knew from my work on The Bible: A History last year. I am pleased to have visited Bethlehem, but pleased too not to have spent too much time there. It makes a good, short visit as part of a larger visit to Jerusalem, which is how we did things. 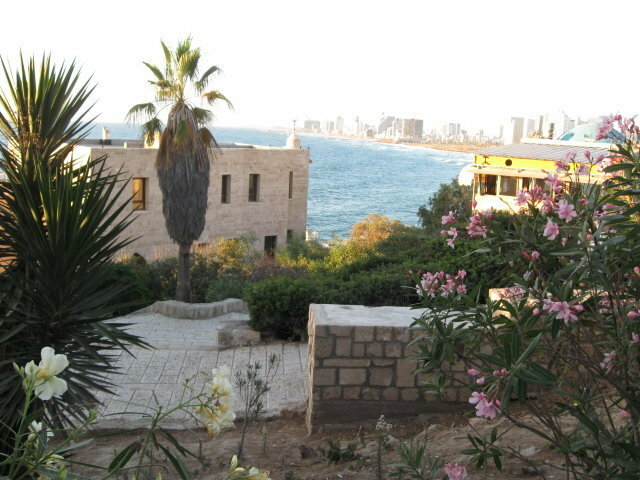 While we were staying in Tel Aviv, we took a short taxi ride to Jaffa (NT Joppa), which is only a few miles down the road. 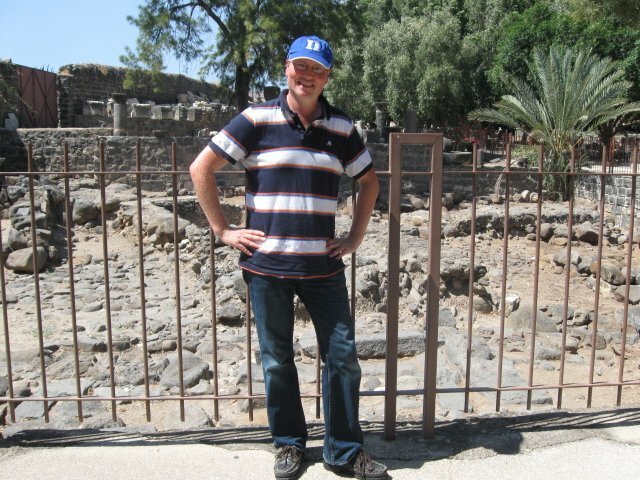 This was our first proper bit of ancient Israel site-seeing and a place steeped in Biblical history. Not far from Aladdin's restaurant, there is helpful plaque summarizing the entire history of the port as it relates to Israel's history. And a stone's throw from that is a little bit of New Testament history, St Peter's Church, the supposed site of the story of Acts 10-11, when Peter has his vision at Cornelius's house. Jaffa is a beautiful place, and an ideal place to be in the late afternoon, early evening. There are cobbled streets in the old city, and great views of the sea. You can explore the place in a matter of hours, and then take time for some food, wine and conversation in a nice spot. We thought about eating at the harbour, but the restaurant owner there was aggressive and unhelpful and so we relocated to a perfect place in the old city, a French restaurant with a rooftop location and views of the sea. We had eaten an enormous lunch at a fine French restaurant called "Messi" in Tel Aviv earlier that day so I was not that hungry in the evening and just went for the fish soup. And it might just have been the best fish soup I have ever had. And we could hear the sounds of the wedding at the synagogue next door, with all the instruments and partying out in the street. I am disappointed to see that The Times is now putting its obituaries section behind their pay-wall. Regular readers may remember that I like to peruse the obituaries section of The Times and often add links here when a Biblical Scholar or a classicist or someone of note has their obituary there. In fact, I once wrote a Times obituary myself. The only consolation about the new policy is that they have kept an open archive available of older obituaries, though without pictures and comments, so links to Times obituaries here will still work. But in future, there will be no more links to Times obituaries in this blog. I have always wanted to travel to Israel, of course. Until recently, I have had neither time nor opportunity to do it, to say nothing of the cost. But this summer, a family friend's bat mitzvah in Tel Aviv gave us the long-awaited opportunity to make the journey. We had ten days and decided to split the stay into three parts. We began, naturally, in Tel Aviv, staying in a so-so apartment, a kind of "work in progress" in Dizengoff St, a slightly scruffy area in the centre of the city, with cats everywhere, but in a convenient location, just a short walk from the shops, the restaurants, the beach. For the Biblical scholar in Tel Aviv, the pressure is off. No Biblical sites to see, no piles of stones to stare at and wonder over. So it is a chance to enjoy some of the other things the city offers. As well as the previously mentioned bat mitzvah, a real highlight was an evening on the beach watching the footy. You see, everyone in Israel loves their football. Even the small bars selling falafel have their TV screens showing the World Cup. Apparently business would be terrible if they did not. And on the Saturday evening, after a relaxing day at the beach, which had soft sand and some spectacular waves, we settled down in the comfortable seaside bar, and we drank Goldstar beer (Israel's own, dark lager beer, easy-drinking and quite acceptable), ate hummus and tahini, and watched the game (Ghana v. USA) on the specially erected big screens, as the waves lapped up just behind them, with our bare feet still in the sand. Tel Aviv, though, is really a fine hub for touring Israel, a great jumping off point for getting to other locations, and of course we did not stay put there the whole time. I'll comment next time on Jaffa. It's time I got up to date with posting the latest episodes of the NT Pod here also on the NT Blog. NT Pod 36 takes a first look at the Epistle to the Hebrews and NT Pod 37 asks "What is the purpose of the Epistle to the Hebrews?" You can listen to the NT Pod online or subscribe in your preferred reader or subscribe via iTunes. 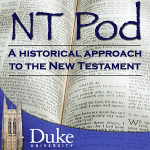 And now you can also find the NT Pod on Facebook, or follow the NT Pod on Twitter. Already there are nine posts in a couple of days, and all of interest. Welcome to the blogosphere.